If you were to ask someone who works with RF a lot and isn’t lucky enough to do it for a commercial entity with deep pockets what their test instrument of desire would be, the chances are their response would mention a vector network analyser. A VNA is an instrument that measures the S-parameters of an RF circuit, that rather useful set of things to know whose maths in those lectures as an electronic engineering student are something of a painful memory for some of us. The reason your RF engineer respondent won’t have a VNA on their bench already will be fairly straightforward. VNAs are eye-wateringly expensive. Second-hand ones are in the multi-thousands, new ones can require the keys to Fort Knox. All this is no obstacle to [Henrik Forstén] though, he’s built himself a 30MHz to 6 GHz VNA on the cheap, with the astoundingly low budget of 200 Euros. [Henrik] admits that his VNA isn’t as accurate an instrument as its commercial cousins, but for his tiny budget the quality of his work is evident in that it is a functional VNA. He could have a batch of these assembled and he’d find a willing queue of buyers even after taking into account the work he’s put in with his pricing. [Henrik]’s work has appeared on these pages several times before, and every time he has delivered something special. We’ve seen his radar systems, home-made horn antennas, and a very well-executed ARM single board computer. This guy is one to watch. Thanks [theEngineer] for the tip. My local RF electrical engineer friend has a VNA, but you’re not wrong about them being expensive. Enough so that engineers from other companies would fly in to town and hire time on it. Another door is open. Well done! Firmware based on HackRF+Airspy. One for the MAX2871 and the other for the LPC437x. It is one thing you have to love about open source you can build on the shoulders of giants, which is so much easier than going back and re-inventing the wheel. I work for a company with deep pockets and they are reluctant to shell out for a low-end model, even after showing them the cost of high-end ones. Managed to borrow one from a sales rep for a week, got the work done, and proved the value of the equipment. Still no approval. I feel like it’s because they don’t understand what I do, just that electronic devices magically appear from my office. The calculation is done by accountants these days. What it is ROI and annual depreciation spread over 5 years. If you provide data on the average number of wasted man-hours by not having the equipment spread over 5 years. Provided the numbers look reasonable, and the cost benefit look OK, that will trigger a rapid purchase order by almost any pen pusher because the hardware will generate money. Sometime you need enough knowledge about how the system works to get things done. so in a sense they also expect the requisite accounting calculations to magically appear from the same office? I don’t have a problem with that as the domain specific workers know the values of their tools better than the accountants. It just makes one wonder again why we need accountants. Yeah. Bean-counters expect you to know how to build your budget, acquit your purchases, order your stock, know spreadsheeting software and accounting software like you use it every day. But I haven’t seen a *SINGLE* bean counter that can drive eCAD, mCAD, operate an IDE (in whatever language you like), as well as the plethora of job specific software that I use weekly. And as engineers, we have to justify our time, our staff and our equipment. But they don’t. It is a wonder that society is at the level of sophistication it now is. The only takeaway is that engineers are a crap load smarter than beancounters. But still a lot for a hobbyist, and a 200 EUR DIY version would be very welcome. Very impressive. May I ask what tool you used for electromagnetic simulation? Is it a commercial tool or free? It looks like CST. He used it in previous project horn antenna. Cool, I see they have a free student edition. I should give this stuff a try before I’m not a student anymore! How do you know he used CST? or you recognize it from the rendering? I wonder what libre/foss tools people use for electromagnetic simulation? FastMaxwell or other? But at-least the work is there for us to look at, and I’m thankful for that. It is a very specialized piece of equipment with a small market. The BOM is expensive and will be very costly when someone have to pay up front for a small production run. I would assume that it would take quite a bit of labor cost for tweak/calibrations, so factoring all that in, the cost would easily 10x the bare BOM cost. So unless you have something like a kickstarter to fund a production run. The MiniVNA posted above for about 400 Euros is basically this brought to market. It is lower frequency but it costs more because they need to recover NRE costs and make a profit. Its about £30,000 for a new R&S ZVB dependent on options BTW. NWT-4000 is half the price of a MiniVNA and covers 138MHz-4.4GHz. It doesn’t come with a case though. I hope that this doesn’t bring me ire for recommending a commercial product, but I did RF integration work for years, and even low-end VNA’s can save hours of headaches if you take the time to figure them out. I had the pleasure of using one of these for a year and it is hard to state how much they are helpful in the field. Saving measurements at a few steps can save hours of time following up and trying to troubleshoot “ghosts” and feedline issues. There are some limitations, and the handheld formfactor is both a blessing and a curse, but the software made up for some shortcomings and being able to export everything as a spreadsheet made the engineer happy. Thanks to Henrik for providing all these open resources, and the practical explanations about the making of this cheap but useful instrument. I don’t know much at all about RF, but recently thought of building some custom NFC antennas for a temporary interactive installation, so i came accross the subject of antenna tuning and the need of a VNA, at least for antenna characterisitcs measurements (like Smith Charts) that help to get the appropriate capactiors values for NFC reader’s antenna block (EMF filter and matching circuit). miniVNA seemed like a nice entry-level solution, but still a bit too expensive for very occasionnal hobbyist use. This is Tsvetelin Velkov, lzhomelab blog. NWT500 will do the job for you up to 500MHz. There are maybe other ways to do the NFC antenna measurements but VNA is the simplest and most accurate method. No need to buy the equipment, I think in US it is possible to rent the equipment (which is also not cheap! ), here in EU there are very limited opportunities for that (perhaps you are in France, maybe you can check is it possible to rent the equipment for some hours). Please note – NWT series, i.e. NWT500, NWT400, etc. are wobblers, not VNA! 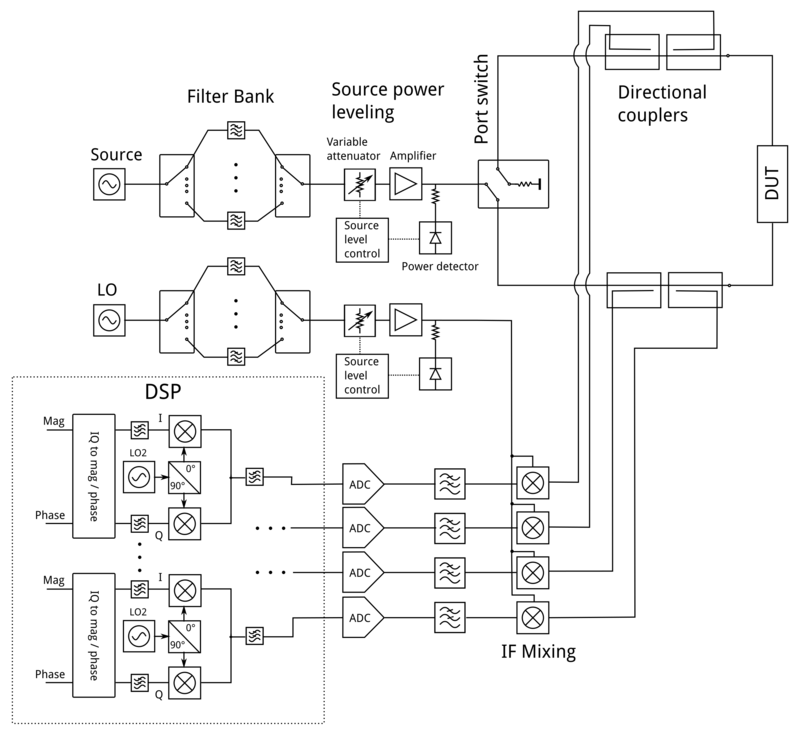 VNA/wobbler is designed to work for certain impedance, i.e. 50 Ohm, 75 Ohm. If you want to work at different impedance you may need some special adapters – perhaps the impedance matching transformers are the simplest way, but they are limited in frequency range.